We are in the midst of a major home remodel and restoration. The type that has taken a while and will continue to take a bit of time. It’s a work in process! We are talking a 1900s home (likely older), it’s huge, beautiful, and chaotic all in one. We are restoring as much of the woodwork as we can but a lot of the home is being remodeled and modernized. I’ve chosen a farm-style/industrial theme for decorating. I know, who hasn’t in 2018? BUT…I insist that it’s unique and personally fits our own style. It’s all about throwing in doses of personalization here and there. 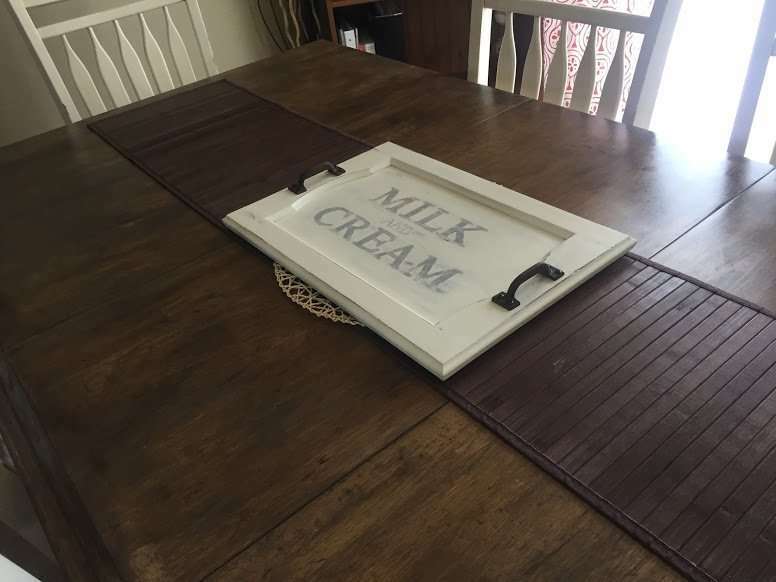 Anyone who is remodeling a home knows that expensive that comes with this, therefore I’m looking for all ways to repurpose furniture as much as I possibly can. 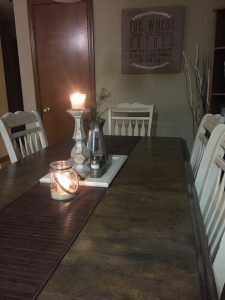 I had an older solid wood Ashley Furniture dining room table that I decided to refinish and give a “farm style” look. After a lot of research and attempts to restain, I finally nailed the exact look I was going for. The original table had been through quite a bit of wear and tear, from toddlers to teenagers and lots of dinner parties. At one point I had refinished it, only for more wear to be had as time wore on. I also learned that I didn’t invest the right amount of time and effort into refinishing it the first time. Patience is not my strength. This time would be different! As you can see in the picture, there is a middle section to this table that was never used. This time around I’ve kept that section in all the time because we have a bigger family and so that it wears at the same rate as the rest of the table. I started by stripping the stain off of the table using a basic paint stripper. I let this sit for about 20 minutes and then used a scraper to gently remove the original stain. I had to do this TWICE. That was same pretty stubborn stuff, and those creases were not for the weak. Let me tell ya! Next, I took a lightly damp sponge and wiped down the entire table and let it dry completely. This removed some of the excess paint tripped in order to help me start the sanding process. After it dried (I waited a day or two) and started the sanding process. This is the most grueling part of the table refinishing. I sanded and sanded until the table was smooth and had the distressed look I was aiming for. Once finished with sanding, I wiped it down again with a damp cloth and let it dry for at least 24 hours. After it dried I use a tack cloth over the entire table to remove any dust and debris. For staining, I attempted two colors and the combination of them both resulted in the color I was wanting. It was accidental but worked out to my advantage! I used Minwax Wood Stain in both Grey and Dark Walnut. I applied the first two layers of Minwax Grey only to realize that this was not the color I was trying needing. It was way too grey. After applying the first layer, I let it dry 24 hours and applied the second layer. I let this dry another 24 hours and then sanded. More sanding. This gave my grey layer a bit of distressed look. Then I hustled to the store and purchased another color, Minwax Dark Walnut wood stain. I applied two layers of this over the grey just as I did the grey. In the same sequence. After the second layer dried for 24 hours, I took a tacky cloth to it again and then applied a layer of polyurethane. I let the polyurethane dry for 24 hours and then it was complete. Lastly, I used an antique white paint to repaint the legs of the table. It gave it a nice clean look to the faded off-white color that it originally was. 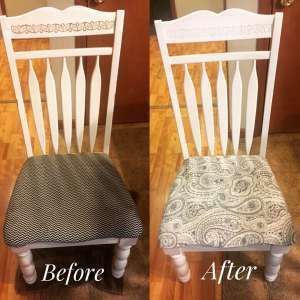 I also kept two of the eight chairs and repainted those in the antique white and reupholster the fabric seats.